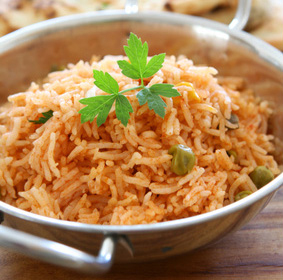 You can make this pilau rice as peas pilau, chickpea pilau or mushroom pilau. Fry onions in the ghee or olive oil in a large pan until golden brown. Add in peas or chick peas or mushrooms. Add the 6 mugful of water and the spices and bring to the boil. Strain the soaked rice and add to the water. Sir well. Bring to boil again. When the water is nearly fully absorbed turn off heat and leave lid on to slow cook. When the rice is cooked serve warm.